OMAHA, Neb. 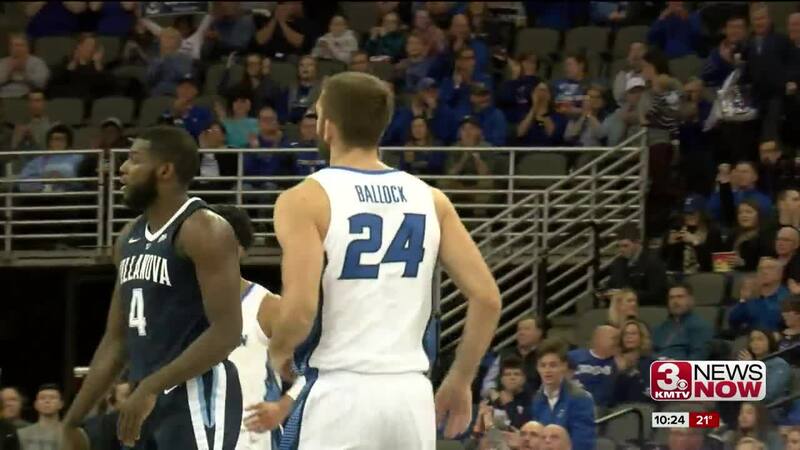 (KMTV) — The Creighton Bluejays fell to defending national champion Villanova 90-78 at CHI Health Center Omaha Sunday afternoon. The Jays led by as many as nine points in the second half before the Wildcats came away with the victory, the team's fifth-straight win. Sophomore guard Ty-Shon Alexander led Creighton with 22 points while junior forward Martin Krampelj added 14 points and 10 rebounds for his second double-double of the season. CHI Health Center Omaha had a sellout crowd of 17,379 for the 11 a.m. tipoff. With the loss the Jays drop to 10-7 and 1-3 in BIG EAST play. "[Villanova is] a solid basketball team," said Head Coach Greg McDermott. "I watched a lot of film on them obviously early in the season and in conference play and they're getting better every game. My challenge to my team is we need to continue to get better and continue to improve. Just focus on daily improvement, everything else will take care of itself." CU starts a two-game road trip Wednesday when they take on St. John's in New York City.